click the button in the application toolbar. See also: Publishing HTML help, Publishing CHM file, CHM export settings. ... or use your own extension. Specify in this field the subfolder where the image files are located. Example: if your HTML files will be placed in /help/ folder and you want to keep all image files in /help/img folder then specify img in this field. 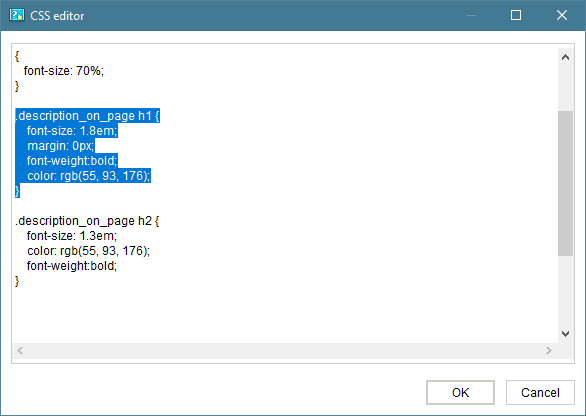 Select this option button and choose a predefined color theme for the output HTML files. You may also create your own color themes by using the buttons next to the theme list. 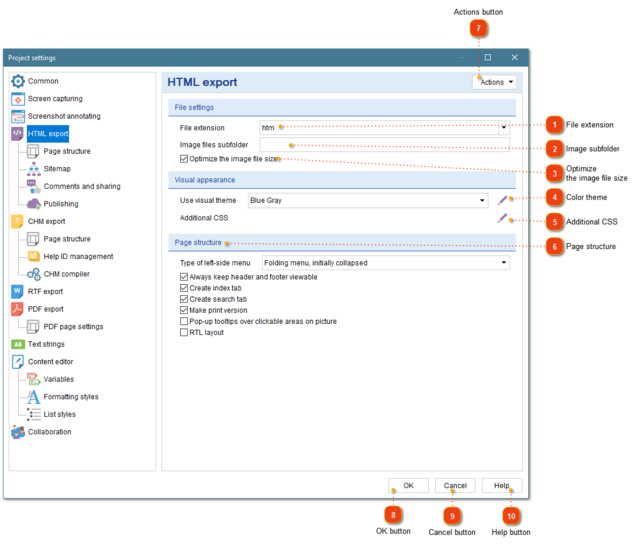 In this section, you can configure the structure of the page. Turn on/off the menu, the keyword index tab and activate the full text search function. If you select check box Always keep header and footer viewable it means that the height of the online manual will be automatically adjusted to fit to the height of the browser window. The header, footer and sidebars will be docked to the browser edges while the central content part will remain scrollable. This resembles the behavior of a CHM file. Select check box Pop-up tooltips over clickable areas to enable pop-up tooltips that will be displayed when the cursor points at the bullet on the screenshot picture. The tooltips may include the associated control description, so that the user doesn't have to scroll down the page to read it. Note: the Print version option is available for HTML export only. Click this button to import settings from another project file or from CHM export settings. Click this button to save your changes and close the dialog. Click this button to discard the changes and close the dialog. Click this button to display help.